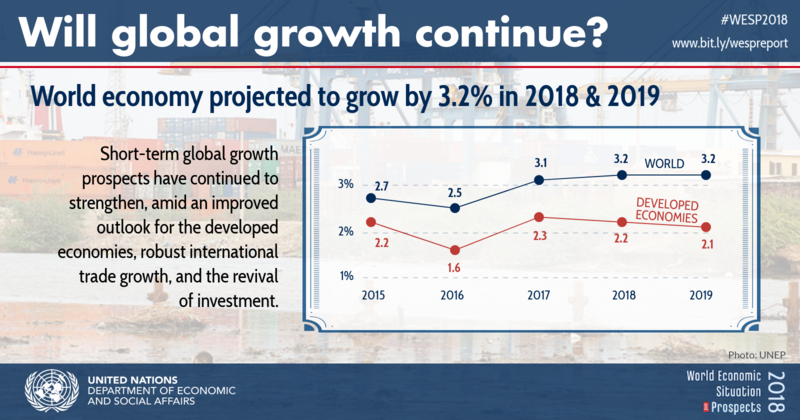 Growth in the world economy continues to exceed expectations and global GDP is now expected to expand by more than 3% this year and in 2019, reflecting strong growth in developed countries and favourable investment conditions. But rising trade tensions, heightened uncertainty over monetary policy, increasing debt levels and greater geopolitical tensions can potentially limit progress, according to the United Nations World Economic Situation and Prospects (WESP) report issued in June. According to the report, world economic growth is now forecast to reach 3.2% both in 2018 and 2019, an upward revision by 0.2 and 0.1 percentage points, respectively. This revised outlook reflects further improvement in the growth forecast for developed economies due to accelerating wage growth, broadly favourable investment conditions, and the short-term impact of a fiscal stimulus package in the United States. World trade growth has also accelerated, reflecting a widespread increase in global demand and the rapidly changing nature of the global transport chain. Many commodity-exporting countries will also benefit from the higher level of energy and metal prices. The report notes that inflationary pressures remain contained across most developed and developing regions. The report underscores the risks have increased as well and highlights the need to urgently address policy challenges, including threats to the multilateral trading system from the rise of protectionist policies, high inequality and the continuing rise in carbon emissions. GDP growth forecasts in 2018 have been upwardly revised in nearly 40% of countries since the previous forecasts at the end of 2017. However, some countries and regions are still not sharing in the global cyclical upturn, in many cases due to structural impediments to development. The UN says the pickup in economic growth offers policymakers greater scope to address some of the deep-rooted barriers that hamper more rapid progress towards the SDGs. This includes measures and specific policies that can accelerate the process of economic diversification, tackle high and/or rising levels of inequality, support investment in basic infrastructure, and strengthen institutions and governance to build a more transparent and dynamic business environment. Action in these areas could also help build resilience against future economic shocks. The economic gains outlined by the UN reflect temporary cyclical factors, but also illustrate some structural changes. Latin America and the Caribbean region, for example, have made significant progress in reducing inequality in the past 15-20 years, driven by specific policy measures related to minimum wages, education and government transfer payments. Accelerated economic growth propelled by fossil fuels, the report found, also bears an environmental cost. Global energy-related carbon dioxide (CO2) emissions increased by 1.4 per cent in 2017 due to factors including faster global economic growth, the relatively low cost of fossil fuels and weaker energy efficiency measures. In consequence, the concentration of CO2 in the atmosphere continues to grow with expected limited threshold of 500 ppm to be reach within 2050 if effective action is not taken. 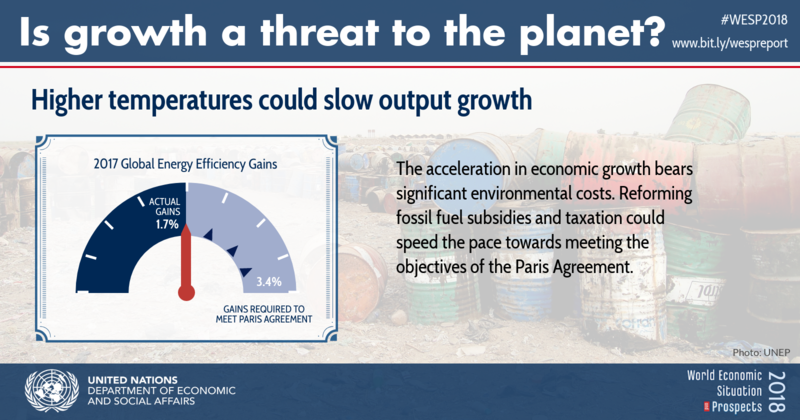 Reforming fossil fuel subsidies and taxation could speed the pace towards an environmentally sustainable growth that meets the objectives of the Paris Agreement on climate change.